In 1935, ČKD began the study for a new tank to replace the LT vz. 35. This would be produced while taking profit of the wide industrial resources of Škoda Works. It was intended to be the main Czech tank, as well as its main export. The main concern was to avoid any issues of the previous model, starting with the suspension. The new model featured four large road wheels, resembling the Christie suspension, but in fact it was a conventional leaf-spring one. This gave some mobility even if the tracks were ruptured and an overall simplified, reliable and easy to maintain system. Other solutions were all well-proven, prewar features, which helped to keep cost reasonable enough both for the needs of the Czech army and the export market. And it was, like previous models, highly successful in this matter. Even before the final vz. 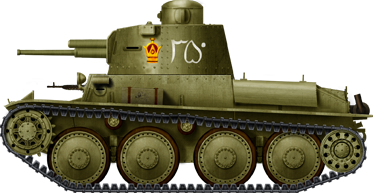 38 was born (army designation), CKD had turned dozens of the TNH series for the export market. The TNH was the blueprint of the the latter model and was generally similar, with many differences dictated by contract modifications. The first customer of the series was Iran, which received 60 TNHP from 1935 to 1937. These were equipped with one Skoda A4 37 mm (1.46 in) gun with 60 rounds and two vz.35 machine-guns with 3000 rounds, one coaxial and one in the hull. 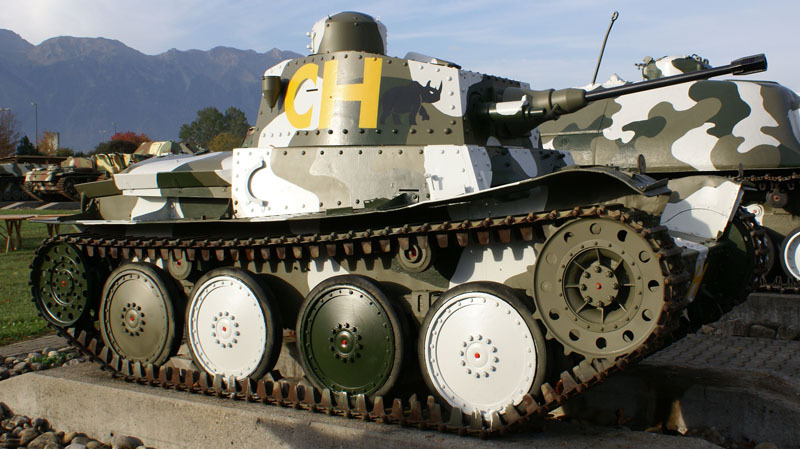 The turret was rounded and “short” compared to the latter 1938 series for the army, equipped with a small turret commander cupola. They were propelled by a Praga TN 100, having 7940 cc and giving 100 hp (73.9 kW). A single derivative (named TNH-S) was reequipped with a more powerful Scania-Vabis engine. This model was sold to the Latvian and Peruvian armies. This was a derivative of the 1936 THN-S (25 built), equipped with a Scania-Vabis 1664 engine with 6 cylinders, water cooled, 7750 cc, 125 hp. The LTP weighted only 7.3 tons, with a maximum 25 mm (0.98 in) of armor. Armament comprised a Skoda vz.34 37 mm (1.45 in) main gun plus two vz.35 and one vz.30 machine-guns. They were fast (25 mph/40 km/h) and reliable, to such an extent that the Peruvian army kept most of them in service until 1988. 24 were delivered just before the German annexation began. They were slightly bigger than the THN (7.7 tons), 4.46 m (14.63 ft) long, with 8 to 32 mm (0.31-1.26 in) of armor. The engine was the Saurer Type CT1D diesel or the Scania-Vabis 1664, which gave an average speed of 45 km/h (28 mph) on road with a range of 300 km, 200 off-road (186/124 mi). Main armament comprised a 24 mm (0.94 in) autocannon, a 7.5 mm (0.29 in) and a 6.5 mm (0.36) machine-gun. The Swiss army spread them into the 1st, 2nd, and 3rd Light Motorized Brigades. When Lithuania approached foreign companies for the needs of their army (still equipped with obsolescent FT 17s), both CKD and Swedish AB Landsverk competed, but only the CKD design was retained, modified as the LTL. Plans included a new armament, comprising the latest Skoda 20 mm (0.79 in) QF autocannon, plus two vz.38 machine-guns. However, none ever reached Lithuania, since it was invaded by the USSR in 1940. The 21 originally ordered and later delivered were then redesignated Lt vz.40 and saw service with the Slovakian army on the Eastern Front. The CKD-Škoda LT vz.38 (or “model 1938”) was a rather conventional, prewar design, with a riveted hull and turret, a set of two bogies sprung by leaf springs, each with its own large road wheel, rear idler, front drive sprocket, engine at the rear with the transmission tunnel in between. Despite the size of the road wheels, there were two return rollers for each side. 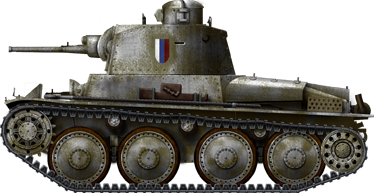 It was a mid-size light tank, bigger and roomier than the export AH-IV tankette, which looked like a scaled-down model. It was armed with the new Skoda A7 37 mm (1.46 in) gun which was envisioned as an antitank weapon, but with provision of HE and AP shells (90 rounds). This was completed by a coaxial, but independent, ball-mounted machine gun, and a second was mounted into the hull bow. Both were vz.37 models, compact and sturdy, also produced in Great Britain under license by Besa. The first units were delivered just when the German invasion started on 16 March 1939. Without the time required for training on the new tanks, none was operational when the Nazis proclaimed, from Prague Castle, the creation of the protectorate of Bohemia-Morava, ending, in effect, the Czech sovereignty. CKD-Praga and Škoda were taken over by the Waffenamt and production of the LT vz.38 was resumed, after modifications for German service, under the name of Panzerkampfwagen 38(t) which stands for “Tschechich”-Czech. Modifications included some finishing details, new commander cupola, but the armament remained virtually unchanged, if not for the replacement of the original Skoda machine-guns with faster MG 42s during the course of the war. 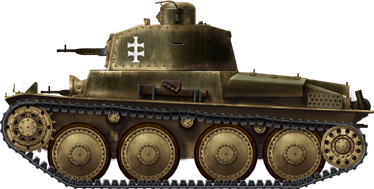 Since Slovakian forces were now part of the Axis, surplus Panzer 38(t)s were given to the Slovakian infantry divisions which took part in Operation Barbarossa on the southern sector in the summer of 1941. Until the winter of 1942/43 at Stalingrad, they roamed into Ukraine and were badly beaten back by the massive Soviet counter-offensive. Some of these also took part in support of the Slovakian uprising between August and September 1944. Total production of the Panzer 38(t) was 1414, and as these were retired from the frontline in 1943, they were replaced by many successful derivatives like the Marder III tank hunter, the Grille SPG, the Flakpanzer 38(t), the scout Sd.Kfz.140/1 Aufklarungspanzer 38(t) and, of course, the Jagdpanzer 38(t), better known as the Hetzer (2827 built from 1944 to 1945). CKD TNHP, the Iranian version of the TNH series, 60 delivered in 1935-37. This one is part of the Imperial Guards. Notice the Imperial Crown, symbolizing the ruling family Páhlaví. These tanks were committed during the Anglo-Soviet invasion of Iran in 1941, but their fate is unclear. 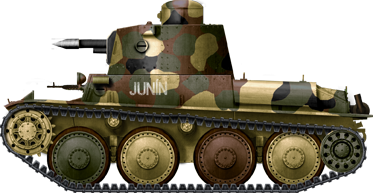 A Peruvian LTP, the “Junin” in 1941. 25 were delivered between 1937-38 and stayed in service long after WWII. They were still extant in 1988. 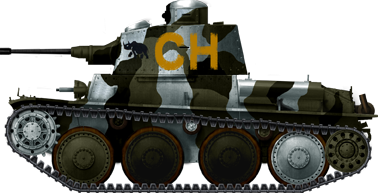 A Swiss Pzw.39 (factory designation LTH) attached to the 2nd Light Brigade, in 1940. Slovakian Lt vz.40, one of the 21 originally intended for Lithuania (original designation LTL) in 1939, but never delivered because of the USSR invasion. Here is the V3.036 of the 101st infantry regiment security division in Ukraine, winter 1942/43. Slovakian Praga LT vz.40c, scout version, only armed with three vz.38 Skoda machine guns, Ukraine, summer 1942. Peruvian LTP at the Real Felipe Callao museum. Just got to this part.